Our iBeacons technology enables businesses to reach out to customers or staff by enabling content such as promotions, information and much more to be presented to users based on their proximity to an iBeacon. It is useful for retail, industry and entertainment or any other venture that can benefit from a location-specific app experience. Mobikats Enterprise provides a full end-to-end iBeacon solution for clients. Our services include consultancy on evaluating iBeacons solutions for your business and integrating iBeacons into your current apps, iBeacons hardware (via our Beura beacons), development of iBeacon app solutions and full support. Contact us to find out more. ﻿What Are iBeacons and How Do They Work? iBeacons are Low Energy Bluetooth transmitters about the size of a £2 coin, which transmit a unique identifier at regular intervals. iPhones and other modern smartphones can detect the presence of iBeacons, which means developers can build applications that respond to the presence of iBeacons, enabling them to notify users of offers, information or deliver an interactive experience relevant to their location. One a user has installed an app which uses iBeacons, the phone will respond to the iBeacons when they are detected, regardless of whether the app is running at the time. If the app is running, the user is automatically taken to a screen dedicated to the relevant iBeacon. If it isn't currently running, the user will be presented with a notification, which can be tapped to launch to specific screens dedicated to each iBeacon. A key advantage iBeacons have over other wireless location-based technology is their simplicity. They are designed to do one thing: transmit a unique ID. All the processing of what to do with the ID is left to the phone application. The value of this approach is that iBeacons are low cost, they can work for years on a watch battery and are therefore also incredibly easy to deploy. This means they are astoundingly flexible and can be used anywhere from shops, theatres, museums and galleries to industrial sites and outside attractions, such as shows and music festivals. Near: within a few metres. Far: greater than 10m up to range of iBeacon, around 50m. You can use these three states to give your customers three different experiences, dependent on their distance from the iBeacon. See the retail example below to learn the value of iBeacons flexibility. Using iBeacons it's possible to talk to your customers as they pass your store even if your app isn't currently running on the customer's phone. This means you can respond to day-to-day retail challenges without the expense of creating physical marketing materials. In essence it's a kind of flash marketing for retailers. For customers it's a chance to get great deals on the move. Once inside a store retailers can position iBeacons near products they wish to market. 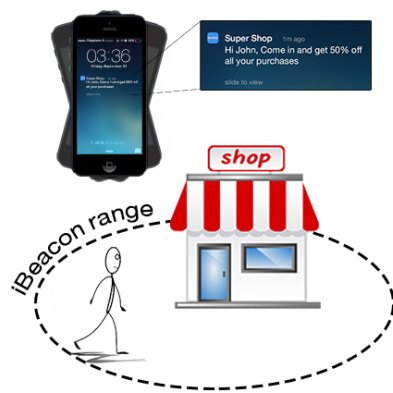 Offers or content can be triggered on customers' phones as they pass within a few metres of an iBeacon. Offers can be targeted at specific customers. For example, a retailer can present a greater number of offers to customers who have signed up to the retailer's loyalty scheme. This creates a rich experience for customers, allowing them to get offers on products they're interested in buying. It's also possible to present customers with rich product content, improving the shopping experience and therefore also improving customer service. How Else Can iBeacons Be Used by Retailers? iBeacons enable retailers to create 1:1 customer relationships in context with their stores. For example, imagine creating new ways to collect loyalty points by positioning them around your store, tethered to iBeacons. iBeacons also enable retailers to track customer movements around the store via the app on their phone registering their presence in proximity to iBeacons. Finally, retailers can help customers find products by using iBeacons to direct them to the correct location. iBeacons provide a new step in customer engagement, which all retailers need to grab before their competitors do so first. The application of iBeacons isn't just for retail, they are being used by museums, sports arenas, industry and also in the home, anywhere location-specific services are needed. Give us a call and let us help you understand where iBeacons can help your business or organisation.